Tea sandwiches are traditionally light, delicate sandwiches sliced small enough to be picked up with the fingers or a pair of sandwich tongs. Teas sandwiches can be cut into triangles or, using cookie cutters, shapes for special occasions. White or wheat bread, with the crusts cut off, can be used for these sandwiches. 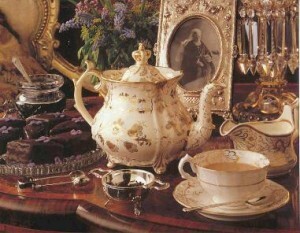 The following recipes are modern interpretations of Victorian tea fare. After cutting off the crusts of the bread and cutting the bread into triangles or shapes, butter both sides of the bread. Cut seedless cucumber (sold in gourmet supermarkets, always wrapped in cellophane) into very thin slices, and place between bread slices. Mix one can of tuna (drained) with tuna seasoning and enough mayonaise to make a thick spread. Spread on prepared slices of bread. You may add thin slices of cucumber if desired along with garnish. Spread cream cheese on prepared slices of bread. Place thin slices of smoked salmon (Nova is particularly good) between slices of bread. Mix sectioned boiled egg and mayonnaise (or use store bought egg salad) and season as desired. Spread on slices of prepared bread. Add thin slices of cucumber if desired, along with garnish. Rinse and dry watercress and lay between slices of bread. Scones are traditionally served with afternoon tea and accompanied by lemon curd and clotted cream. You can add a variety of treats into the batter, such as raisins, fresh apple bits, orange peel, cranberries, and chocolate chips. Lemon Curd is a traditional spread for scones, and is usually served with Devonshire (or clotted) cream. The lemon curd is rich and smooth, and can be kept refrigerated for up to two weeks. You can buy "English Double Devon-cream" at any fine grocery store or use the simple recipe (below) for clotted cream, which is perfect for spreading on scones. In a bowl, sift the flour, baking poweder, and sugar. Add butter and blend until mixture resembles coarse meal. In another bowl, beat together the half-and-half and eggs. Stir the egg mixture into the flour mixture until just combined. Add the nuts and raisins and stir until dough is formed. On a lightly floured surface, pat the dough into a round 1/3 inch tinkc, then, with a 2 1/2 inch cutter, stamp out rounds. (Optional) Brush scones with egg-whites and sprinkle with granulated sugar. Transfer rounds to a buttered baking sheet, arranging them 2 inches apart, and let stand for 20 minutes. Preheat oven to 400 degrees Farenheit. Bake the scones for 15 to 20 minutes or until lightly golden. Wisk 1 cup sugar and 2 large eggs in a bowl until blended. Sift in 1/2 cup fresh lemon juice. Pour into a saucepan and cook over low-medium heat stirring constantly for 20 minutes. Do not let the mixture come to a boil (lest it curdle or burn), but allow it to gradually thicken. When the mixture thickly coats the back of a metal spoon, remove pan from heat and stire in 1/4 cup butter until melted. Pour the mixture into a bowl and cover with plastic wrap. Refrigerate the mixture for at least 4 hours. The lemon curd will thicken as it cools. Mix 1 cup heavy cream and 2 tablespoons Confectioner's sugar using an electric mixer. Whip until stiff peaks form. Gently fold in sour cream and mix until thick. Place in refrigerator and chill until time to serve. If made ahead of time, it will keep in the refrigerator up to 4 hours. Many special dishes were created in Queen Victoria's honor during her 64-year reign. Among them was a dessert called Cherries Jubilee, which was invented for Victoria's Diamond Jubilee celebration in 1897. This Jubilee Cake, which uses Cherries Jubilee as a filling, is a truly fancy dessert in grand Victorian style. Beat the egg whites until they stand up in soft peaks. Beat in the 1/4 cup of sugar a tablespoon at a time. Without washing the beater, beat the egg yolks with the lemon juice until thick and lemon-colored. Gradually beat in the 3/4 cup of sugar. Pour the yolk mixture over beaten egg whites and fold together gently with a spoon or spatula until well blended. Spoon the batter into two unbuttered 9-inch layer pans. Cut through the batter gently several times to break any large air bubbles. Bake about 30 minutes. Test by pressing lightly with a finger. If the cake springs back, it is done. Invert on a wire rack and cool. Cream the sugar and cream cheese together. Add remaining ingredients and beat until thick. Dissolve the sugar in the claret and pour over the cherries. Let stand for several hours. In a small bowl, mix the cornstarch with 3 tablespoons of the cherry juice. Heat the cherries in a sauce pan to the boiling point. Lower heat and stir in cornstarch mixture. Simmer, stirring constantly until thickened. Remove from heat, add spices and lemon juice and allow to cool. Place one layer of sponge cake on a cake platter and spread a layer of cream filling about 3 inches wide around the perimeter of the top of the cake. Cut out the center (in a heart shape if you are using heart-shaped pans) of the other layer, leaving a 3-inch border. Put aside the center piece you cut out. Place the layer with the cut-out center on top of the other and press down to make the layers stick together. Decorate by placing a paper doily on top of the cake and sifting confectioners' sugar over the doily. Carefully remove the doily and fill the center of the cake with the cherry filling. Beat the whites of nine fresh eggs to a stiff froth. Mix egg white mixture with fifteen spoonfuls of fine white sugar and five or six drops of essence of lemon. Drop mixture on paper with a teaspoon, sift sugar over them, and bake them in a slow oven.